Early in the Bulls’ 93-88 win over the Philadelphia 76ers Saturday, Joakim Noah bit the head off a live rooster. Later in the first half, Noah drew a technical foul for explaining to 76ers forward Evan Turner how one man launches another to the moon. And before the evening was over, Noah operated on himself without anesthetic. Well, he did draw a technical foul even if it seemed like the other parts were possible the way Noah agitated his way to 12 points, 13 rebounds in seven assists to support Luol Deng’s 25 points, including a crucial eight down the stretch, as the Bulls hung on after an eight-point fourth quarter lead shrunk to two with under three minutes left. Were you more emotional tonight? Noah was asked. “Yeah,” he said gathering himself long after the game. He wasn’t growling, but it looked like he might. “Did it have anything to do with last year’s playoff elimination by the 76ers?” Noah also was asked. “One of the reasons, yeah,” said the usually voluble Noah. Whatever it was, and 76ers coach Doug Collins seemed upset as well at some of the aggressive screens Noah was setting, the Bulls returned to the grind-it-out formula win we more expect this season, in part thanks to Noah’s emotional effort. The Bulls moved to 8-7 with their second consecutive win AM. Yes, After Milwaukee. There’s no forgetting that one, and the Bulls hung on as Carlos Boozer also had a double/double with 12 points and 12 rebounds and Taj Gibson and Jimmy Butler began to emerge as the Gibson/Omer Asik defensive pair of last season. Gibson had 11 points and eight rebounds in coming out of his early season malaise, and Butler was typically aggressive on the boards, did a nice job harassing Jason Richardson into three of 12 shooting and hit a big three in the fourth quarter with the Bulls ahead 71-68 with 8:28 left. And now they may not have everybody. Richard Hamilton, who shot well and had 15 points, came up lame with 3:15 left in the third quarter and the Bulls trailing 62-59. Hamilton went up in a jump, not being hit. That sort of injury often is serious, though Hamilton limped back into the game down the stretch to make three of four free throws when the 76ers were fouling. Hamilton also walked into a crucial offensive rebound of his own miss with 11.6 seconds left and the Bulls leading 91-88. The 76ers, led by Holiday’s 23 points, then fouled Hamilton again. He made both and the Bulls escaped. Hamilton said he’ll get an MRI Sunday and hadn’t had an X-ray yet. He said he wasn’t in pain, so decided to return to the bench. Thibodeau said he was then cleared to return, if needed. “As long as my right arm is good, I’m good,” Hamilton quipped. But Hamilton also said when he went up he heard something “pop.” This is generally not a good thing unless you are chewing gum. Hamilton was not. “I was able to put a little weight on it, so I could go back in the game,” Hamilton said. “It wasn’t 100 percent or anything like that, but I felt I could help the team. When I jumped up, as soon as I came up I felt something pop in the bottom of my foot. Yeah (it scared me). The simple fact no one was around. If it is something, the Bulls do have a roster spot and we could see a return of Jannero Pargo. His agent, Mark Bartelstein, was quoted a week ago saying the Bulls were among several teams inquiring about Pargo, released by the Wizards. Also, Quentin Richardson is presumably hanging around along with another former De Paul player, Bobby Simmons. But the Hamilton inconvenience brought back the horrific memories of Derrick Rose’s serious knee injury against these same 76ers the last time these teams met in the playoffs last season, an upset win after Rose went out in Game 1 and Noah went out with a severe ankle injury in Game 3. Most of the Bulls players pretty much said it was just another game since both teams had substantial roster turnover since then, though we knew they only occasionally tell us what they are thinking. Noah is one who has difficulty hiding his thoughts and emotions, as we know. His sister and father were at the game, and it was Turner who before last season’s playoffs said he preferred the matchup with the Bulls because he felt it favored the 76ers, and that the 76ers had dodged the tougher team and the 76ers should now have an opportunity to win. I didn’t see Noah hug Turner after the game. Turner, from St. Joseph’s High School in Westchester, was prescient, though he didn’t mention it would take Rose and Noah not playing. Still, it seemed clear Noah hadn’t forgotten, though it took a while for the Bulls to turn their anguish into anger. The 76ers, a surprising 10-7, are a difficult team to play and prepare for given the way Collins changes matchups and often plays small without the injured Andrew Bynum. The 76ers haven’t gotten much this season from Spencer Hawes and Lavoy Allen. So Collins uses 6-7 Thaddeus Young at power forward and frequently changes backcourt matchups during the game to have the quicker Holiday chasing the shooting guard over screens and Turner on the point guard to deny the offense. That frustrated Hinrich early, though he came up with a huge 21 footer with 1:14 left to give the Bulls an 87-81 lead and then played big defense with a block on the 76ers last gasp three by Holiday that effectively ended it. Deng pretty much got the Bulls going after they fell behind by seven early. He scored the last seven points of the first quarter to give the Bulls a 22-19 lead, and the Bulls probably didn’t look for him enough early with mismatches he had against Turner and Richardson. My favorite was a terrific 10 footer as he was squeezed on his right. The 76ers are a good defensive team and are aware to play strong to the dribble side. But Deng reversed, going behind his back, which he does infrequently, and moved into space for a 10 footer with 2:34 left to keep the Bulls ahead by four. I’m now calling him Pistol Lu. As for that play, Deng said he was in a two-man game with Noah and the 76ers called out a switch. But Deng said there wasn’t time on the shot clock to probe the mismatch, so he took off right and made it. But Deng has to work more now, as does everyone else. So it’s going to be more difficult, obviously, and more uneven. Deng said he’s counseled Noah about that, especially the expanded playing time. Noah must be as he’s standing up well averaging 39 minutes per game. And he came flying into Saturday’s game with six points and six rebounds in a rollicking first quarter along with a block and three assists. Noah isn’t quite able to take advantage on offense of the smaller matchup the 76ers played with Young. Noah’s offensive game isn’t quite his strength. Advance scouts aren’t quite yet considering it the terminator. 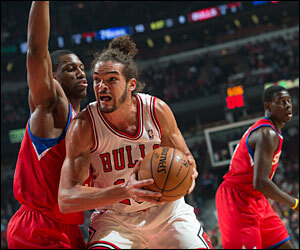 But Noah helped the Bulls to a 50-37 edge rebounding. Thibodeau after last week’s bench/starter debate seems to have settled on using Gibson with Butler, a sprinkling of Belinelli if he is hitting, and Robinson, though usually with two starters with them. 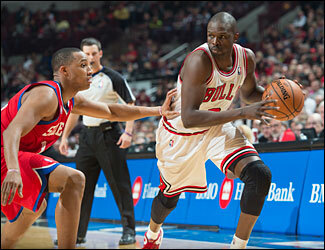 The Bulls struggled in the second with Noah and Deng out, going almost four minutes without scoring. Though the Bulls got a solid stretch from Robinson and recovered enough to be tied at 41 at halftime as Noah got into am animated discussion with Turner and drew a technical foul. The Bulls went to 6-1 when holding opponents under 90 points, and it’s what they have to do. They don’t much push the ball anymore after trying early in the season and mostly settle into half court sets. They are not stale with plenty of movement, but points do not come easy. And most games the Bulls are looking for someone to stand out and make some shots. It’s been Deng more often than usual with a sixth 20-plus game of the season. The 76ers took a lead in the third with Hinrich and Noah having trouble controlling Young and Holiday and the 76ers forcing numerous switches. One time Thibodeau recognized a 76ers out of bounds play, screaming for Noah for the back cut, which he missed. Thibodeau shakes his head a lot, though he did that when the Bulls were winning 85 percent of their games. The Bulls regained control midway through the third as Noah and Boozer worked their two-man game well for a Noah slam. The Bulls now are 8-0 since 2010 when both have double/doubles in the same game. Hinrich hit a three and then Deng closed another quarter strong with a pair of scores on cuts to give the Bulls a 67-64 lead after three. I thought Robinson did a good job pressuring Holiday on defense to open the fourth, causing a pair of turnovers and the Bulls hit the big baskets: The Butler three, the Hinrich jumper, a terrific Gibson finish on a three-on-one, another Gibson slam (seven in the fourth quarter) on a pass from Noah and Deng’s back to back scores to make it 81-76 and 83-79 after a Holiday three that held off the 76ers. Yes, we’re all still wondering. But each small step helps. Though it would help more if Hamilton can take them without discomfort.